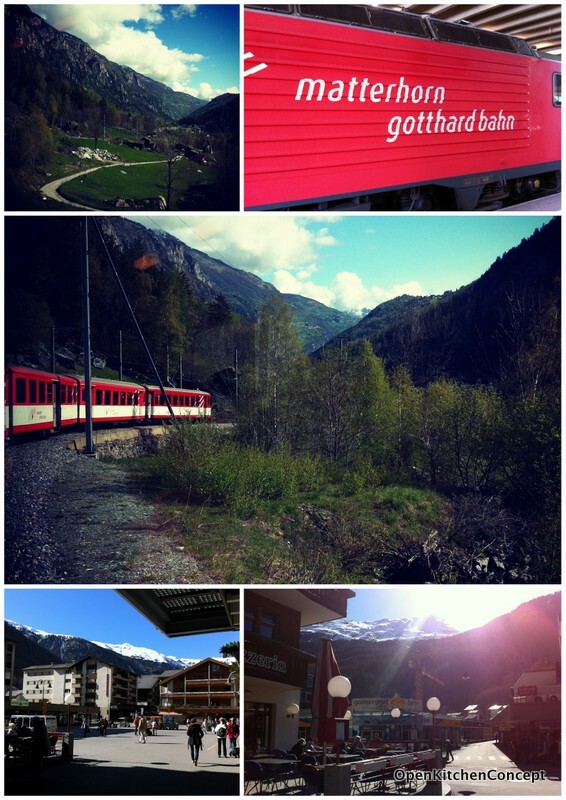 It was a rather long, though lovely train ride from Montreaux to Zermatt. One nice way to travel to Zermatt would be to take the Glacier Express from St Moritz. It'd definitely be a route I'm keen to take next time! The village of Zermatt lies at the southern end of the Matter Valley, which is in the southern part of Switzerland. The village is almost completely surrounded by the high mountains and the most famous peak is the Matterhorn, at 4,478 m.
A colleague of mine highly recommended that we visited Zermatt. It's an old-fashion looking village that is charming in spite of its popularity with skiers and tourists. The village is a combustion-engine car-free zone, which means that you only see silent, battery driven vehicles around. This makes the air extremely fresh and supposedly helps with a clearer view of the Matterhorn. We stayed in a very nice guesthouse in Zermatt with a great view of the Matterhorn. Although it was early May when we were there, there were still plenty of snow around and hence there were still many skiers around, doing a last ski before summer arrives. It was a pity we weren't able to ski this time around. Nevertheless, we took the cable car ride all the way up to the Matterhorn and enjoyed the great views. Hopefully, I'd be able to visit this place again in the future.. and I can ski then! Before going up the mountains this time, we made sure we had our lunch first.. This is a really HUGE calzone!